(Watertown) New Rep’s The Kite Runner is adapted for the stage by Matthew Spangler from the novel by the same name by author Khaled Hosseini. Director, Elaine Vaan Hogue, interprets her subject with fresh perspective in our post-9/11 world with compassion and ingenuity. Kite Runner is a story of brotherhood and forgiveness as told by Amir via self-defining stories of his childhood. Amir experiences an act of violence against his Hazara servant and best friend Hassan that changes the course of his life forever. In an effort to “make thigs good again” in the eyes of Allah, he travels home to Afghanistan to search for Hassan’s son. Amir is played by two actors in this adaptation. 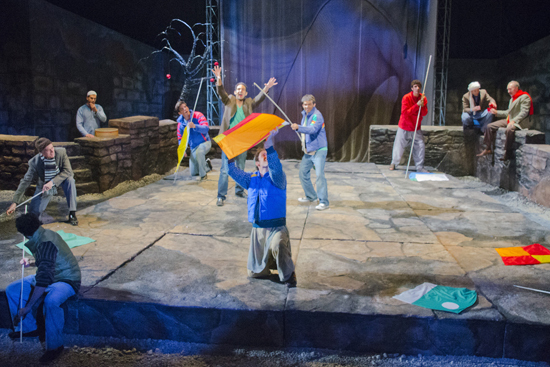 In an act of dramatic bravery, adult Amir (Nael Nacer) and young Amir (Fahim Hamid) share the stage as the play unfolds. The two Amir’s share focus so naturally that one might think that the novel was intended to be interpreted this way; a testament to Nacer and Hamid’s capabilities as actor’s. The audience is able to follow both characters simultaneously as Nacer narrates long monologues effortlessly and Hamid engages with the cast. They make a cohesive duo. The entire cast creates a solid ensemble. There are no loose links in this show. Of particularly notable mention are Ken Baltin, John Zdrojeski and Luke Murtha. Baltin is an absorbing Baba, Amir’s father, who is plays the patriarch with equal parts strength and mercy. Zdrojeski is terrifying as the sociopath Assef. Murtha is heart-breaking as Hassan. Murtha steals many of his scenes due to his sincere and expressive portrayal as Amir’s best-friend. Brava to Paige Clark. It could not have been an easy feat being the sole female of the cast. The majority of the production is excellent. That being stated, elements that are less than excellent are immediately apparent. The accent work is good but the Afghan accent has clearly not been mastered by several of the cast members. The majority of the staging is inventive and engaging. Whether it is the fault of the script or other factors, there is a scene in the second act that introduces the 1980’s in California that is incongruous with the production. At worst, it is a cheesy homage to Regan-era subculture that is better suited to a musical. 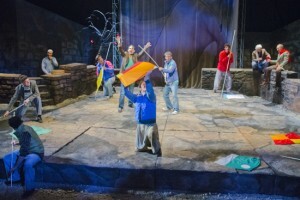 The Kite Runner is a brilliant production. The cast is fantastic, the props are incredibly creative, the sound design (featuring actor and musician Fred Williams) is seamless, and the fight choreography is beautiful is its believability. The adaption is loyal to Hosseini’s novel but the grandest aspect of the production is that one need not read first to appreciate the performance. This entry was posted in Drama and tagged 2012, Afghanistan, Arsenal Center for the Arts, Drama, Elaine Vaan Hogue, Fahim Hamid, Fred Williams, Hazara, John Zdrojeski, Ken Baltin, Khaled Hosseini, Luke Murtha, Matthew Spangler, Nael Nacer, New Repertory Theatre, Paige Clark, Regan-era subculture, September, Taliban, The Kite Runner, Watertown by Kitty Drexel. Bookmark the permalink.